Evolving out of three private schools founded in 1879, the first public school in Wichita Falls opened in 1880 in a log cabin. Five years later the former Wichita County Courthouse was relocated to Tenth and Scott streets for use as a school. 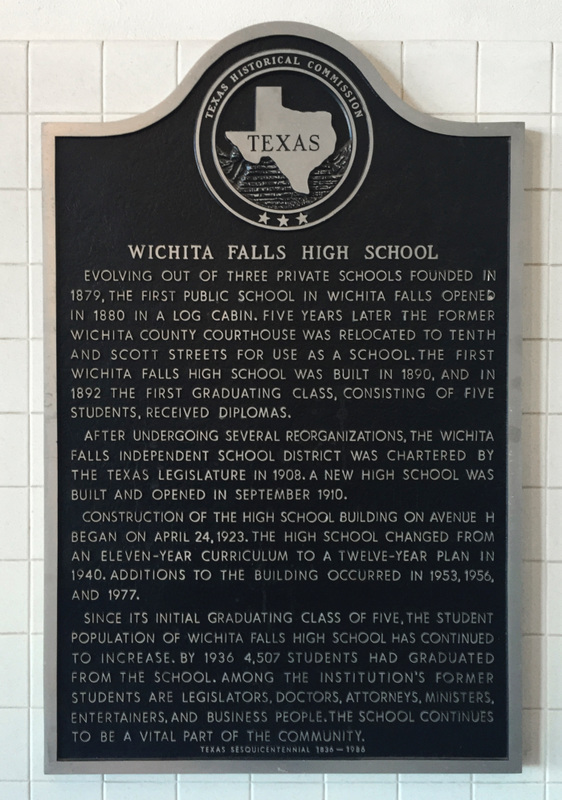 The first Wichita Falls High School was built in 1890, and in 1892 the first graduating class, consisting of five students, received diplomas. After undergoing several reorganizations, the Wichita Falls Independent School District was chartered by the Texas Legislature in 1908. A new high school was built and opened in September 1910. Construction of the high school building on Avenue H began on April 24, 1923. The high school changed from an eleven-year curriculum to a twelve-year plan in 1940. Additions to the building occurred in 1953, 1956, and 1977. Since its initial graduating class of five, the student population of Wichita Falls High School has continued to increase. By 1936 4,507 students had graduated from the school. Among the institution's former students are legislators, doctors, attorneys, ministers, entertainers, and business people. The school continues to be a vital part of the community. 2149 Avenue H, Wichita Falls Texas 76301. The marker is inside the foyer of the main entrance, on the wall to the left. GPS 33-degrees 53' 38.9" 98-degrees 31' 1.2".